Last year K our youngest son spent 2 months volunteering at a school in Costa Rica. One of the dishes he learned to like in Costa Rica is Beans and Rice. During the past year he and I have developed our own recipe for Beans and Rice. This past Saturday he and we were going to make some Beans and Rice. However he ended up working all day. But his brother J came to clean, wash and wax P's car. So I decided to make a double batch of the Beans and Rice by myself. This way I would have some for lunches and the two boys and daughter K would also have some. I had soaked the beans over night and cooked them Saturday morning. After lunch I cut up the peppers and onions. I had placed them in a large pan to sauté and was adding the spices. Because of my neuromuscular problems, I managed to spill an entire tablespoon of Indian Chili powder all over the wheelchair the floor and myself. At this point my daughter K said she would help me. So I read the rest of the ingredients to her and she added them to the pans. I was doubling the recipe so I had K double the amount of rice from 2 cups to 4 cups of uncooked rice. I also doubled the amount of all the hot spices. When K's mom came home and saw what I was doing, she mentioned that rice triples while cooking. She asked me if I had remembered that fact. I thought I had, however, P told me that my pot wasn't nearly large enough. So P and K divided the mixture between two pots. After simmering for one hour I did a taste test. WOW DID IT HAVE A LOT OF HEAT. Son J said that instead of doubling the spices, I should have only increased the spices by half again as much. Even though doubling the original recipe was a learning experience for me, and the Beans and Rice may have more heat then I wanted, they taste good. If you try you can taste the different spices. Here is my Beans and Rice recipe. 8 oz dried pinto beans cooked, or 16 oz cooked beans. 1 tsp. of pepper flakes. 1 Tbs. Indian Chile powder. 1 canned chipotle chili + 1 Tbs. adobo from can. Sauté the onion, peppers, with all the spices except the habanero pepper. Combine everything in an 8-quart pot. Bring to a boil turn down to a simmer and cover for about one hour. Pinto or Kidney beans work, Phil prefers Pinto as they have more texture. Actually any dried beans will work. Adjust spices as needed. If too spicy just add more cooked rice. If missing ingredients, fill in with whatever is handy. Remember that this is a EXTREMELY forgiving recipe. Last Saturday after lunch I started feeling under the weather. P had a cold so I thought that I might have been catching it. We had been using Clorox Disinfecting Wipes on everything we both handled, but I thought I might still be catching her cold. However, a couple hours later I thought I might have a temperature. Out comes the thermometer and sure enough I was running a slight fever. By early evening it was 100.2 and because my normal temperature is 97.4 this meant I really had a temperature. However, by 10 PM Saturday evening my temperature was back to my normal 97.4. Every time in the past that this happens I end up with another lung infection in a couple of weeks or so. Sunday evening we had our small group from church. It was great to have a group because I don't always have to talk. I can just sit back and listen. This way I hear a lot of news without having to run out of air. However, I was suppose to lead the discussion time. Only when one is on a ventilator it sometimes can be hard to lead. So, one of the ladies took the booklet and would read the discussion questions and once again all I did was listen and nudge her when I thought it was time to move on to the next discussion question. I don't remember much about Monday except I wasn't able to stay awake. I think I must have taken about 4 naps. Some were long and some were short naps. I do remember watching the beginning of one TV show and waking up in the middle of the next show. I did this a number of times. Tuesday a couple of friends stopped by to visit. Both of these guys are in their late 70's early 80's. But we always have more then enough to talk about. One had just returned from Wisconsin where he and his wife helped a local Christian School make hundreds of frozen apple pies which are sold as a fund raiser. He and his wife have been going there to help out for years. The other guy had just recovered from a bad case of pneumonia. His wife told my uncle who told me that the pneumonia was so bad that the doctors at the Emergency Room wanted to hospitalize him. Only he refused and left the hospital against medical advice. So once they returned home his wife called their son who is a doctor in another state. The son came down and after examining his father agreed that he should be in the hospital. However, my friend is stubborn and stayed home. To hear my friend tell the story he wasn't sick and felt like he just had a bad cold. The first words these friends said when they walked in were "We can only stay 15 - 20 minutes." One hour later they finally left. Friends are great; I just love talking to these guys. Every time they would say they were leaving, I would start them on a new topic. Yesterday, I had an appointment with my pulmonologist. She listened to my lungs and frowned and said my lung sounded rattly. She then looked at the inner Trach cannula and frowned even more. When she asked how I was feeling I told her about the temperature episode on Saturday. More frowns and she has ordered another sputum culture. So we will see how this one turns out. I think it will come back clean and then and a month or so I will have another Pseudomonas infection. Today a friend is bringing chili for lunch. Sounds good to me because the weather has finally turned cooler. My friend has an extremely active 3-year-old, which should make this an interesting visit. As I read this post over it appears to be disjointed. Oh well I am just going to post it and go work a Sudoku puzzle. We left home last week Thursday and headed to C,K&L's. Not much happened on Thursday except that per usual I was exhausted by the time we arrived at their home. Daughter in-law K said that L had just gone down for a nap, so I decided to follow his example and took a nap also. When L and I woke up from our naps, he helped Grandma carry all of the cases in from the van. It is amazing how much help 3-year olds can be. Thursday evening we just visited. Because I can't get into the spare room with my wheelchair, P and I arranged all my ventilator things so that I could sleep on the living room couch. About 5:00 - 5:30 Friday morning L woke me up. He came and climbed up on the couch next to me. After a couple minutes he gets down from the couch, goes into the kitchen and returns with some dry cereal and a glass of orange juice. I get to hold these while he gets back on the couch and settle down next to me. So began each of my morning at L's house. He would wake up, come by me, get his snack and orange juice then sit next to me. While he ate his early morning snack he would tell me all about his world. I learned about his two teachers at school, about his Sunday School teacher, about the baby sitter across the street. However, the most interesting thing I learned from L was what happened when supper spilled over in the oven and the smoke detectors went off. He told me this story a couple time so I think it must have made a big impression on him. About the time he finished his snack it would be time for my nebulizer treatment. He would climb down from the couch and bring the nebulizer over by me. Then he would get the Albuterol and empty it into the nebulizer cup. After I had the cup connected to my ventilator circuit he would turn on the nebulizer and climb back up by me to continue telling me all about his world. Saturday morning his two uncles drove up for the weekend. 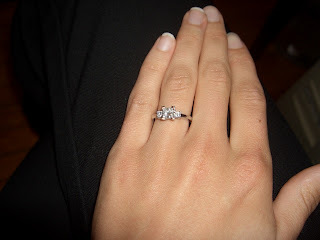 While we were waiting for them to arrive our daughter K called to tell us that she was engaged. She and boy friend K were downtown Chicago on Michigan Ave when he dropped to one knee and asked her. While we were expecting this it still was a pleasant surprise. Once L's uncle arrived we all went to a pancake house for breakfast. After that we drove to where we thought there would be a farmers market. We drove around and around and never found the farmers market. I guess we will have to buy apples from one of the local markets back at home. The rest of Saturday was spent relaxing, and visiting with the two boys. It is always nice to sit around and catch up on all the news. Later Saturday afternoon, son J, grandson L and I went to the grocery store to buy food for supper and Sunday dinner. We purchased a pork loin and decided to use it for Sunday dinner. Son J. cut the pork loin open and stuffed it using a recipe he found for stuffed pork chops. Along with Italian roasted potatoes and his mother's apple dumplings it was a great dinner. After dinner we all had to take naps. Late Sunday afternoon, the two boys headed back home and we waited for L parents to return from their weekend away. Monday morning P and I returned home. What a weekend we had. I will write more about our time with our grandson later. First I have a lot of things to catch up on. I will say that it was a great weekend. Today P and I are traveling to visit our son and daughter in-law. They are leaving tomorrow on a weekend away and we are watching our 3-year-old grandson. I've spent a quiet week resting up for this weekend. Hopefully there will be more to write about next week when we return. It's been a busy week. Monday I had my Groshong CV Catheter removed. I am glad to have it out, one less spot for a possible infection. Tuesday I had a "Hi How Are You" doctor visit. Wednesday I rested up from the first two days of the week. Yesterday was extremely busy. I've been having trouble with my Trach. Air has been blowing past it which can be a problem when using a ventilator and a cuff-less Trach. So yesterday morning when P. got to work she called my pulmonologist and asked whom she wanted me to go see. They said they would call the E.N.T. doctor, the surgeon who installed my Trach, and get me in to see him. They also said to come to the clinic as soon as we could. Well P. came home from work, we got there at 11:00 they said "To bad, so sad, should have been here at 10:00. Go away come back after lunch at 1:00PM." So we did. Then the Doctor came in the room and said, "To Bad, So Sad, Only one doctor left here, 6 new patients, come back Monday afternoon." So we spent the day going nowhere. However, we did go out for lunch at a new restaurant which was a nice thing to do. Today my nephew a college student is in town. He is on fall break and came to visit friends who go to one of the local colleges. Because his friends have class today, he is coming to visit. His mother told me to put him to work, so I have a list of things that need to be done. It seems that there is always something needing to be changed, cleaned, repaired or replaced around here. Hopefully nephew I. can get some of those items removed from the list. I wonder what an uncle and a college student, who haven't seen each other much over the years, will have to say to each other. Then tonight my sister, brother in-law and their son are coming. They hope to arrive before midnight. Nephew J. is running in the Chicago Marathon Sunday. Tomorrow morning they will go down town Chicago and pick up his race kit. So Sunday he runs and his parents, Aunt P. and cousin K. will cheer him on. Tomorrow sons J. and K. plan on coming to use the garage. They want to work on their cars getting them cleaned, waxed, and ready for winter. So like I stated in the title, I am "Still Busy".